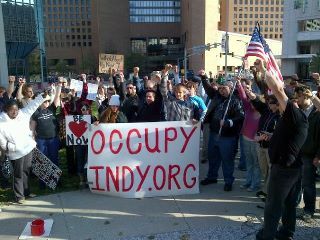 Occupiers in the Heartland: Indianapolis, IN on October 15, 2011. Critics will say the demonstrators have failed to articulate a clear message and have yet to tell us what it is they want, but if you read the extensive chatter on the Internet via blogs, videos, photo essays and news articles, there is a consistent theme: It’s time to stop bailing out private equity companies with public funds. People are angry. The impetus of this whole movement is the financial meltdown of 2008 when privately owned banks took lots of money from the Federal Reserve (that’s us, folks!) and kept it for themselves. No jobs were created, no public infrastructure built, no public institutions funded and no loans for small businesses that make up the fabric of the U.S. economy. They took our taxes and bought themselves fancy toys. And nobody did anything about it, at least not right away. Fast forward to Sept. 2011 and you have Occupy Wall Street. So it took little while, but these movements have to build over time. How does the Occupy Movement relate to local food? In addition to organizers’ commitment to feed protestors well, I see a strong connection between holding the 1% accountable for what they’ve done with taxpayers’ money and the growing movement to ask how our food is produced. Food activists have shown us how simple questions lead to change. They held the food industry accountable for questionable practices. Who wants to eat a hamburger from the ground beef of 50 different cows? Consumers got angry about industrial farms and facilities where animals were caged and workers were paid non-livable wages. Profits trumped sanitary procedures that led to nationwide foodborne illnesses, sometimes fatal. They didn’t like that pesticides were being dumped in waterways and that the overuse of antibiotics had become a routine practice of the beef and dairy industries. Is it too much to ask that the milk we pour our toddlers be drug free? Of course not. The millions of Americans who have made local and organics the fastest growing segments in the food industry are de facto activists. Over the past twenty years, they have affected policy by creating the National Organic Standards and new federal dietary guidelines. Increasing awareness for labels like “grassfed” and “free range” have followed. They have fueled a resurgence of family farms and Community Supported Agriculture co-ops from Vermont to California, and made studying agriculture in colleges viable again. Their questions led to anger, which led to activism, that led to policy changes. They occupied mealtime and have established a seat at the head of the table. *Marie Antoinette is widely known as the person who said this, when in fact, it was said 100 years earlier by Marie-Therese, the wife of Louis XIV. But you get my point. I love you Julie! You are just amazing.You have a way of presenting the entire world situation in simple words. Except for the word impetus that I had to think about until I figured out it probably means start. I should look it up. Regardless, I think your points are excellent. I agree with you about the calmness of the occupation. It’s so sad to think that a few people just took tax payers money for their personal gain. I can’t stand it actually. What a world we live it! Hard work, is our motto here. Unfortortunately, and fortunately. As far as food quality goes, I recently attended a Johns Hopkins’ lecture that had some disturbing photos and facts that you mentioned here. It’s scary. You’re absolutely right, Julie, that this will not stand, and for just the reasons you say. Americans are opting out of faceless systems and opting for connection with other people, people who stand behind what they do and take responsibility for creating a better life for everyone.